Delicate and flaky puff pastry with a creamy pumpkin spice cream horn filling. They are THE delicious embodiment of fall! Being the life-long foodie that I am, a lot of my childhood memories revolve around food – all the likes, the dislikes, and the new experiences are usually intertwined with some specific moment. And now that I’m grown and doing the whole “adulting” thing it’s become a never-ending challenge to learn how to make (and reminisce about) all my childhood favorites at home. When I was a kid, I was the only one in the house that showed cream horns the admiration they deserved, and it was always like finding gold if my mother let me wonder enough in the bakery section to stumble across a package of them. If I ever did get so lucky to spot them, it was pretty much a guarantee that I’d be allowed to put them in the shopping cart, because my mother knew I was thisclose to throwing myself on the ground and screaming if I didn’t get my way. If only that tactic still worked for this whole “adulting” gig. Over time, I plan to make all the flavors and styles of cream horn that I can think of, because really, is there even such a thing as a “bad” cream horn? My family might think so, but I disagree! So to kick things off in proper fall fashion, I started my puff pastry extravaganza with pumpkin spice cream horns. Because these really are the delicious embodiment of fall. You don’t need to slave over the intricacies of puff pastry – just buy the puff pasty sheets from the frozen food section of your favorite grocery store. The filling is a little more involved to make than most pumpkin spice cream recipes you find, but you can also control the amount of pumpkin, pumpkin pie spice, and cinnamon to your liking. You could even get super fancy and add some orange food coloring to give them a more authentic pumpkin look. I skipped the food coloring this time around, but only because I liked being able to see grains of the pumpkin pie spice in the cream. Note: you will need cream horn molds to make these. Amazon sells them really for cheap (in boxes of six)! On a flat surface, unfold one puff pastry sheet. Using a pizza cutter, create 16 strips by cutting once across the dough and then six cuts up the length. Separate one of the dough strips. Using a rolling pin, roll the dough lengthwise so that it doubles in length (don't worry about width). If the rolling pin keeps sticking to the dough, sprinkle a small pinch of flour on the dough. Starting at the bottom, begin wrapping one end of the dough around the cream horn mold. After wrapping the dough around once, pinch the seam to secure it, then finish wrapping down the length of the mold. When at the end of the dough, lightly press along all the wrapped edges so that they're sealed. Repeat the last two steps until all cream horn molds are wrapped. Place the wrapped puff pastry dough on a parchment lined baking sheet. If possible, place the molds so that the top end seam of the dough is on the bottom. Bake puff pastries in the oven for 10-12 minutes or until golden brown. Bake in batches of 16 or less at a time. Remove baked pastries from oven. Allow to cool for 5 minutes on the baking sheet, then remove molds and transfer pastries to a wire rack to cool completely. When ready to serve, place cream cheese, pumpkin puree, brown sugar, pumpkin pie spice, and vanilla extract in a medium mixing bowl. Using an electric mixer, beat on high until there are no longer any clumps of cream cheese, about 1-2 minutes. Add cool whip and beat on medium for another 2-3 minutes until smooth. Pour pumpkin filling into a Ziploc bag (gallon sized) and cut a small hold in a corner. Use the bag to pipe pumpkin filling into the "mouth" of the baked puff pastry. Dust tops of cream horns with powdered sugar. Serve immediately. Store in the refrigerator or freezer until ready to eat. I LOVE LOVE LOVE cream horns. A little bakery in town makes them and I always find an excuse to go get one. This filling sounds amazing and I can not wait to try making them myself! Thanks for sharing! I don’t have the horn molds and don’t want to buy them. Could this be made in another manner with puff pastry? 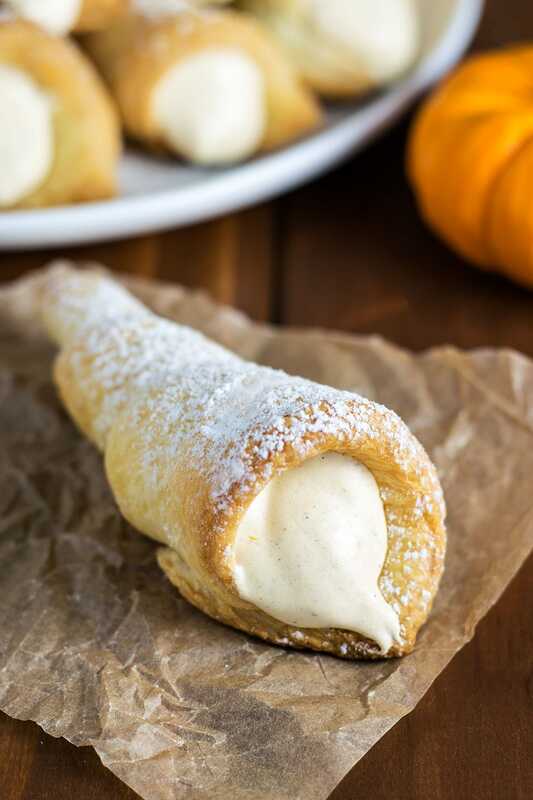 Your Pumpkin Spice Cream Horns are featured on Full Plate Thursday this week. Hope you are having a great day and enjoy your new Red Plate! users would definitely benefit from a lott off the information you provide here. Please let me know iff this okay with you. Regards! of ownership with a sense of beauty and artistic interpretation, the answer in most cases is yes.